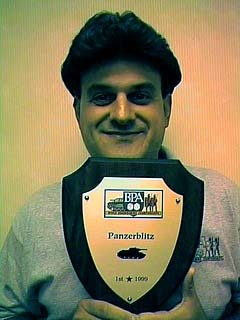 A repeat winner was crowned in Panzerblitz this year, as Bill Scott successfully defended his championship vs Marty Musella. 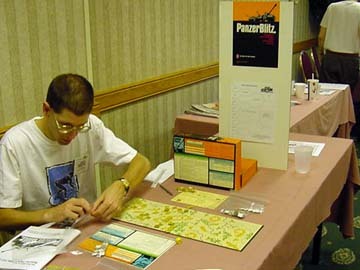 The scenario chosen for the final was Tournament Scenario #2 as designed by Alan Arvold. This is one of three 6-turn games with multiple victory conditions that he designed specifically for the WBC. Alan really outdid himself on these, by blending play balance, low turn count, and utilizing one board, he truly brought forth a winning design. All three scenarios have three different victory conditions, one of which is picked at the end of the game to decide the winner. The interesting thing is, not knowing which will be chosen, but at the same time playing for all three. Unless you have lost all three conditions, the outcome is usually never decided until the end. Marty had a lead in the early going, as he pushed his Soviet force onto the east end of the hill 132 plateau while also flanking Bills' German force along the west edge of the hill. By turn 4, Marty had the lead in victory conditions 'A & B'. This was an aggressive move on Marty's behalf, it forced the German to fight on two fronts (sound familiar?) while providing the Soviets with an easy access to leaving the board. Bill countered by going after victory condition 'C', eliminate units, by targeting Russian spotters and weaker units. The Russian tried valiantly to attack Bednost, but the German defense was too strong to allow any spotters to survive. On turn 5, two Soviet trucks loaded with artillery tried to flank the German on the south side of hill 132, Marty then realized they may be in a vulnerable position, he tried to reinforce with a T-34c, but to no avail. Bill found a slither of ground to launch an attack on the tank, overrun for elimination, and subsequently overran the two trucks for elimination as well. This swung the tide in the German favor, which now led victory conditions 'A & C', while the soviet clung to 'B'. Marty tried desperately on the final turn to attack and also flee the board in hopes of swinging the outcome back in his favor, this proved to be an impossible task. The dice was rolled to see which victory condition would be the deciding factor, with Bill having 'A & C' sewn up and Marty ahead in 'B'. Victory Condition 'C' was rolled and the GM shook Bill's hand to declare him the winner. It was a great final, played excellently by two very highly skilled players, but ultimately, Bill proved last years win was no fluke by defending his crown. I would also like to congratulate Marty Musella, whom I nominated for the Sportsmanship Award, for playing a terrific final. Marty is every GM's dream, a gentleman in every sense of the word, a highly skilled competitor who will graciously accept a loss as well as a win. His consideration of his fellow gamers is always paramount in his behavior. If I had to illustrate the word Sportsmanship, I would show you a picture of Marty Musella. Thanks once again to my Assistant GMs, Alan Arvold and Bill Scott.I really am fortunate to have them. Alan has just recently completed the new Wargamers Guide to Panzerblitz, which I strongly recommend for anyone who would like to take advantage of Alan's keen insight into the game.